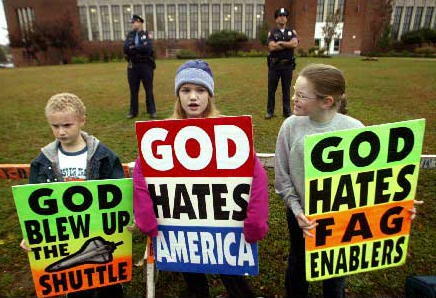 The Westboro Baptist Church had their day in court and won. Now emboldened by the Supreme Court 8-1 decision upholding their protests and actions as free speech, they vow to quadruple their protests at military funerals. As much as I hate giving Westboro Baptist free license to continue their vile messages of hate, it’s nice to see the Supreme Court upholding the Constitution. WBC hates the military, gays, Jews, the Academy Awards, and among many others -Elizabeth Edwards who after her son died, had in vitro fertilization! Nor do I like to see some imbecile burn the Stars & Stripes, but that’s what makes America great. We have the right to say those things in the name of the First Amendment- okay, maybe except for Representative Peter King who took a lot of heat for holding the House hearings on the Radicalization of American Muslims last week. Certain members of his own committee, many Democrats, and liberals all over the place labeled him racist and showed utmost disrespect for those Muslim Americans who did come forward giving very compelling and moving testimony regarding their children who had been recruited and radicalized through Mosques in America. Oh yes, there’s also that free speech case lingering in Detroit, Geller Vs. Detroit where the City of Detroit caved to Islamic pressure and refuses to run paid advertisements on city buses shown below. Apostates (those who leave Islam) are commanded to death in the Qur’an and the law of Islam recognizes no national borders. This ad is sorta like those giving refuge from domestic abuse, but so far the city of Detroit won’t allow them. What happened to free speech there?